SHERWOOD — In its final year as a member of the Three Rivers League, Sherwood High School had, probably to no surprise, another big year. The 2017-2018 campaign was one full of success for teams and athletes at Sherwood. The Lady Bowmen girls soccer team won the Three Rivers League championship and went on to reach the second round of the Class 6A state playoffs. The Sherwood boys cross country team won its first league title of any kind in 22 years. The Bowmen went on to finish seventh at the Class 6A state championships. The Sherwood boys track and field team took eighth place, and the Sherwood girls finished in 10th at the Class 6A state championships. The Sherwood football and girls basketball teams each reached the second round of the Class 6A state playoffs. The Bowmen boys soccer, boys basketball, baseball, girls lacrosse and boys lacrosse teams all qualified for postseason play. The Bowmen also had individuals qualify for state-level competition. And, as usual, the Sherwood seniors played a big part in all of the Bowmen success during the 2017-2018 school year. Here's a brief look at some of the seniors, in addition to Times Athlete of the Year Lauren Scarvie, who stepped up big for the Bowmen the past school year. 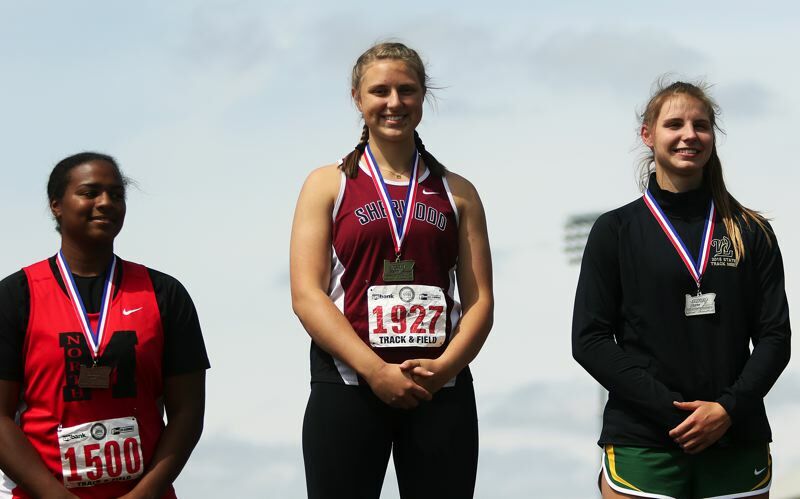 Shelby Moran finished her storied Bowmen track and field career in spectacular fashion, as she won Class 6A state titles in both the shot put and discus events. Moran also set an all-time state record in the discus at the Three Rivers League district meet. Nic Garrision was a hard-hitting lineman for the Sherwood football squad. He also was a power-hitting first baseman for the Bowmen baseball team. Jayden Cuthbertson was named the Offensive Lineman of the Year for the Three Rivers League during football season. He earned a trip to the Class 6A wrestling state tournament and he was a shot put and discus thrower during track season. Olivia Corsetti and Ashlyn Strohmaier helped the Lady Bowmen girls soccer team win the TRL title. Carsen Christensen was a fullback and linebacker for the football team. He also took fourth place in the shot put event at the Class 6A state track and field championships. Josh Quaglio helped the Bowmen boys cross country team win the league title. He also ran in the middle distances for the track and field team. Owen Grubbe was a high-scoring guard for the boys basketball team. He also was a key player for the boys lacrosse team. Rustin Williams was a key player at running back and linebacker for the football team. He also took sixth place at 182 pounds at the Class 6A state wrestling tournament. Riley Aggson was named the Three Rivers League Pitcher of the Year during baseball season. Payton Churilla tied for third place in the boys pole vault event at the Class 6A state track and field championships. Zane Sands was a physical force for the Sherwood football and boys lacrosse teams. Andrew Mabry had solid seasons for the Bowmen boys cross country, wrestling and track and field teams.